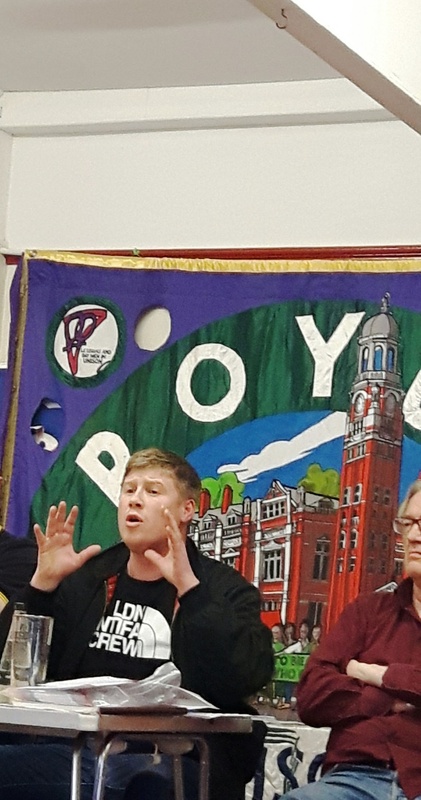 Ted Knight, chair of the Croydon Assembly, has launched the People’s Manifesto for the council elections, calling for a mobilisation of communities against the government. The General Election of last year had made it very clear that communities in Croydon, as in Britain at large, wanted austerity, an end to rising inequality and the loss of services. Croydon Assembly’s ‘Save our Schools – Stop Education Cuts’ developed an action programme on four fronts when it met on February 24 at Ruskin House. The working groups met following the launch of the Assembly’s People’s Manifesto for the council elections and a video message from John McDonnell MP, the shadow chancellor. – house prices have rocketed, putting them beyond the reach of most local Croydon residents. Croydon Council claims it’s doing its best. But too many council schemes seem to favour private developers. And through Brick By Brick, the council is acting like the developers in imposing new schemes on estates while ignoring residents’ views. Meanwhile, Tory attacks on welfare add to housing misery. As for private landlords, they are out of reach and out of control. Tell us what policies councillors should back at next May’s election. We will then campaign with you to get support for your ideas. After a couple of guest speakers, the floor will be open to you. Who is in control of our borough? Not working people, that is for sure. Decisions about local jobs, housing, education, nursery provision, care for older people, surgeries, hospitals, transport, local amenities, parks and open spaces are out of our hands. Our voices and interests are ignored in favour of developers and what the government tells the council to do. Democracy is noticeable by its absence in Croydon just as it is throughout the UK. The Croydon Assembly that met in November 2016 came together to debate the absence of any meaningful democracy in the area and to propose an alternative People’s Plan for the borough and beyond. Here are the summaries of discussions from the four working groups. They will be used to develop an action plan and update our manifesto. Next, we split up into groups to brainstorm ideas for ‘What an ideal education system would look like’. After which, we then fed back our ideas. Restore EMAG (Ethnic Minorities Achievement Grant). (i) it allows LA strategic managers and schools to bring about whole school change in narrowing achievement gaps for Black and minority ethnic pupils, which in turn ensures equality of outcomes. (ii) it covers some of the costs of the additional support to meet the specific needs of bilingual learners and underachieving pupils. We then read the proposed NEU Model Resolution on Education Funding. We added, that we should write to Councillors, as well as MPs. Also, the resolution ought to mention, that the government should cut corporation taxes to improve the economy. We ended by looking at the success of the Finnish education system where children are not obliged to do homework. The national curriculum is composed of broad guidelines, giving teachers more autonomy. The Finnish state provides universal early childhood education and care, which is believed to link with why Finnish students have the highest scorers in the world. • We believe that within every child there’s a genius, and that schools are there to help children and young people all reach their potential. • We need flexibility in the curriculum, not over -prescription but space for children’s needs and interests. • Each school should have a library run by qualified librarians, so the school is well-resourced and children and young people have quiet spaces for learning. • We would give support to senior management so that they feel empowered to allow teachers to teach and children to learn. • We give low marks to the existing Ofsted system, it needs to be supportive and advisory, not number crunching. • Bring back professional centres so that teachers can meet together and look at research so their teaching is informed by research instead of government diktat. The cost of house ownership and private sector rents makes it more and more difficult for teachers and other key workers to live in London near where they work. The NUT Manifesto for London for the Mayoral election outlined specific proposals for reducing rising costs. increasingly the supply of affordable homes and introducing rent controls. As this issue affects other key workers NUT wants co-ordination between the unions to campaign on these issues. However this should be seen within the need for the wide campaign for Council house building, rents people can actually afford etc. Croydon TUC should initiate a discussion among its public sector affiliates. Inadequate housing has an adverse effect on parents and pupils e.g. no quiet space for homework because of shared bedrooms; loss of sleep affecting ability to pay attention in lessons. At secondary school if pupils cannot do their homework they get detention. Housing costs for parents make it difficult to pay for school uniforms and the extras children need. In some schools there is pressure on parents to donate money on a regular basis because of the cuts in school funding. Pupils who move school, regularly either tread water for a term or slip backwards educationally. Schools need to be sensitive to the housing and income realities faced by many of their pupils. There is inadequate funding for refugee children. Croydon teachers are paid on outer London salary scales, which makes recruitment and retention problems when getting a job in Merton or Lambeth means they can get London weighting. The childrens’ services crisis revealed the pressures the Council is under. There are problems with the administration of the special needs procedures especially with delays in paying schools once education and care plans have been agreed. (This I and two fellow Governors have taken up with the Deputy Cabinet member). The work of Fit2 Learn (Croydon based) shows that for little money motor skills and co-ordination problems many children have can be rectified dealt at low cost improving their enjoyment and capacity to learn, and reducing the remedial costs throughout their school careers. Primary schools can imaginatively ensure a creative approach across the curriculum through careful planning. Primary schools can ensure that children experience the basic demographic processes, through elections of class representatives to School Council and for Head Boy and Girl, including candidates ‘manifestos’, hustings, voting, and the School Council members counting the votes. The education of children should be seen within the whole context of children, including family poverty, mental health, lack of youth provision, etc. A democracy should mean government by the people – how does that relate to education? Education should ensure that people are given a choice. But some people in the ruling class consider it is dangerous to give tools and weapons to the working-class people. Education is now marketised. The purpose of education under the current system is to prepare people for the existing economy – but this is in contradiction to the ideals and aspirations of those who work in it. Children should have the choice of whether to learn in other ways than academic university orientated ones, for example doing something technical. Education should provide an open space where people can debate what is going on in the world, but it’s not like that, especially with the media being so narrow in its debates. The curriculum is becoming more narrow, when there is in reality a huge debate that needs to take place. While social media does break through to young people, even that is problematic, because it’s dominated by massive companies like Facebook and Google – it’s still not quite democratic. There is opposition to Prevent scheme, which brings in idea of “radicalisation” – but what is that? What is it that government wants to do? What is the role of education in democracy? There is a need to retrieve some of the democratic changes and gains made during the 1960s, including “circular classrooms” and free university education. Education should be a place where young people can get well-informed, can debate freely without being judged, so that they can make the right decisions for their lives so that they can contribute to our society. rather than conform to a narrow curriculum. The General Election of last year made it very clear that communities in Croydon, as in Britain at large, wanted austerity, an end to rising inequality and the loss of services. What he called “racketeers” had made millions in profit from the privatisation of our essential public services and now people were demanding that their voices be heard – not just on election day but in all decisions that have an impact on the wellbeing of their families. Ted Knight said that people were “rightly suspicious” that developers were getting more and more involved in the affairs of Croydon and alarmed at the way schemes were pushed through without the support of local communities. So the Manifesto called for open and binding ballots of the residents whose homes are affected. It also demanded the end of the so-called cabinet system of local councils where power and all decisions are in the hands of a select few. The Croydon Assembly is being recalled to prepare a People’s Plan for the borough that aims to put communities in charge of making the decisions that affect their lives. Many people have told us how powerless they feel. Decisions about local jobs, housing, education, nursery provision, care for older people, surgeries, hospitals, transport, local amenities, parks and open spaces are out of our hands. Our voices and interests are ignored in favour of developers and what the government tells the council to do. Democracy is noticeable by its absence in Croydon just as it is throughout the UK. There is a growing demand for change. This was seen in both the impressive social movement that supported Jeremy Corbyn’s re-election as Leader of the Labour Party and also in the EU referendum result which expressed, among other things, people’s frustrations with the political set-up at local and national level. On November 26, the day will belong to you. After an introduction by Philipa Harvey, former president of the National Union of Teachers and local activist, we will break into groups to discuss how we plan to put people in control and create a proper democracy in Croydon and beyond. In the afternoon, groups will focus on key issues like housing, education, social care, transport, local employment and council services to develop proposals to go into the People’s Plan. These will be brought together in a session of the whole Assembly, so preparing a practical programme for campaigning at local level. A packed meeting at Ruskin House on June 9 took part in Croydon Assembly’s EU referendum debate. They heard Eddie Dempsey, RMT national executive member, arguing for a vote to Leave the EU and Steve Freeman, from the Republican Socialist Alliance, called for an abstention. Mark Serwotka, general secretary of the PCS, spoke in favour of Remain. 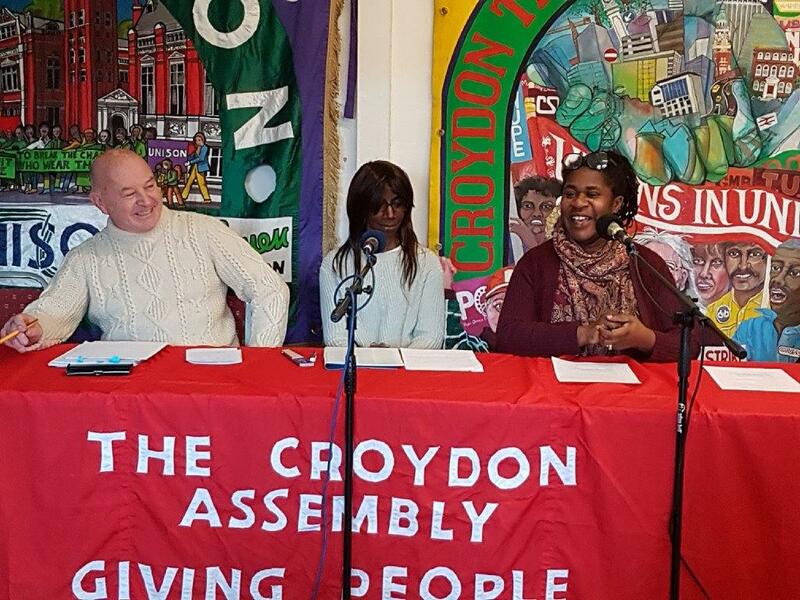 The fourth Croydon Assembly held on March 19, 2016, saw the launch of our Manifesto 2016. This was drafted by a number of working groups last year and came before our November 2015 Assembly for discussion and amendment. Please read/download and circulate as widely as possible. The March 19 Assembly was addressed by Matt Wrack (right), leader of the firefighters’ union, Philipa Harvey, president of the National Union of Teachers, Ted Knight, Assembly chair, Dr Philip Howard, BMA, Paula Peters from Disabled People against Cuts, Nick Mattey, Stop the Croydon Incinerator, Ellen Lebethe from the National Pensioners Convention and representatives of other campaigns.